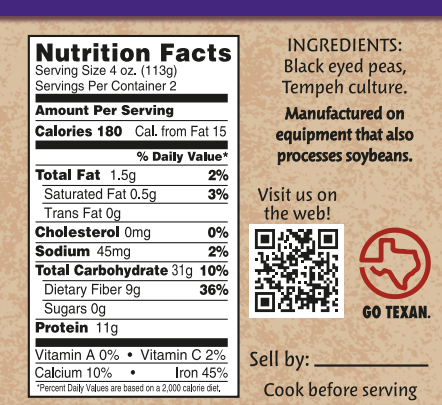 Black-Eyed Pea Tempeh is Soy-Free and Gluten-Free. 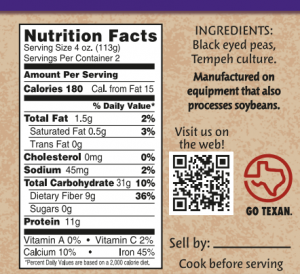 Black-Eyed Pea Tempeh is an excellent alternative to traditional soy tempeh. Although it is lower in protein, it is much higher in iron. The flavor is much earthier than traditional soy, and pairs nicely with citrus. My personal favorite use is in vegan Lemon Picatta. Black-eyed pea tempeh can easily be used in any tempeh recipe. All of our Tempeh is sold frozen, you can usually find us in the frozen meat alternatives section of your local health food store. We don’t use any preservatives, we also don’t pasteurize our tempeh. Pasteurization is required in order to make tempeh shelf stable in the refrigerator section for long periods of time, it also gives tempeh a bitter flavor. Tempeh that has been pasteurized loses a lot of it’s flavorful mycelium (the white mushroomy outer layer).